I don't think we have properly thanked you for all of your help! We are currently working on a nice thank you gift, but it's been delayed. The fundraiser was a huge success. We have several people in Sendera ranch and the neighboring area that have been asking when we are doing it again. With your permission, we'd like to do a second run on April 9th of the same product. Before then, we have a gentleman willing to buy a lot of cedar mulch (over 10 yards) which we have added the purchase price into his cost. We have received nothing but glowing reviews of your products. I truly hope this increases your sales. We've been telling all of our customers where to get great compost, soils, and other materials. They are in love with you in our area. One of our customers David Ashton actually stood up in front of his church group, told everyone how picky he is with flowerbeds and gardening, but that he reserved a small area for the Scouts to do to help them. Then he testified about how he made a mistake. He said the mulch was FAR superior to anything at the garden stores or home depot. He was impressed with the professionalism of the Scouts. He wasn't even home to give direction, and they executed perfectly. He wishes they would have done ALL his areas (he's one of many asking about April). Bottom line, we were wanting a fundraiser that encouraged work, team work, and bettered the community. I can't imagine anything that fits that ideal better than this one. You are amazing people. It was a pleasure to meet all of you. We would like to offer you a service in return. If you know of anyone that you deem worthy, and you want to provide them a service, we have a small army of labor at your disposal. Last week I purchased 16 bags of your Black Anvil Color Enhanced Mulch. This was the first time I had visited your plant. To say the least, I was very impressed. Your counter rep, Ken was very helpful in getting me loaded and providing a little history and education on Silver Creek Materials. Very easy to use and the contrasting color speaks for itself. I used five and a half bags for this application. I can guarantee you I will be back to buy more product. Silver Creek Materials could not have approached us at a better time, offering us a solution to our landscape material needs. I cannot express how much their team has worked together to engage with us and make sure all of our needs are met. 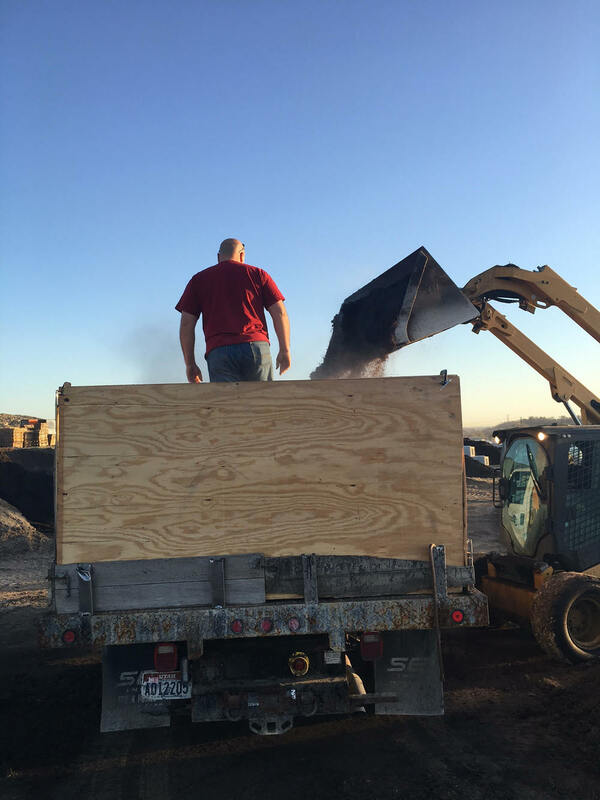 We needed more than just materials, but a vendor that could provide excellent customer service, safe material handling, the ability to adapt to changing needs, and a true attempt to understanding our business. Each of those items were issues prior to this spring, but Silver Creek has stepped up and met each one of them above our expectations, and has been doing it consistently. We are very thankful for this and we’re looking forward to working with Silver Creek for years to come! Silver Creek Materials is a great partner. They always go the extra mile to take care of our needs. Their products are far more superior than the competition and their service can not be beat! I like working with Silver Creek Materials because the sales team especially Shannon, have done everything possible to assist me at my store to be successful. I am pleased the quality of the product and certainly like having a sample box with the materials. The quality of the materials makes him quite competitive the only thing I would like to see more of is his promotion of the product. The price point is virtually the same as the larger companies that have marketed their products to a greater extent. If I could choose one thing to help with the sale of the product additional promotion either in print or radio would be phenomenal. It is a pleasure working with people who have similar values and direction in their business and personal lives. I enjoy partnering with Silver Creek for many reasons. I initially changed because of pricing, then it became about customer service. All the staff has been helpful to our business knowing all the product and making good suggestions. I also like having a charge account. It easier for my crews to get what they need and go not having to worry about each transaction. Silver Creek Materials is a joy to work with! With their great customer service and exceptional products it cuts out any issues in the purchasing or selling process. They’re soils and mulches fly out of our yard due to their premium quality. We can see the difference! Reordering is a breeze thanks to their knowledgeable, friendly staff. Great company run by a stellar staff. We have worked with Silver Creek Materials for the last 3 years. We have found that they provide very high quality products and their service is exceptional. The staff is extremely friendly and helpful and work to meet all our needs. The product pricing is very competitive and often lower than their competition. The products they carry are diverse and are superior to many other companies that we have used. We are pleased to use Silver Creek Materials .